Reduced time for testing, increased quality concerns combined with an increase in the number of devices and configurations highlights the importance of Software Testing playing a vital role in the DevOps process. An automated continuous testing solution is a key driver in DevOps triggered early within the development process. TestPoint has invested into developing test accelerators, solutions and dashboards for our customers which help measure the quality based on the latest release and configuration. 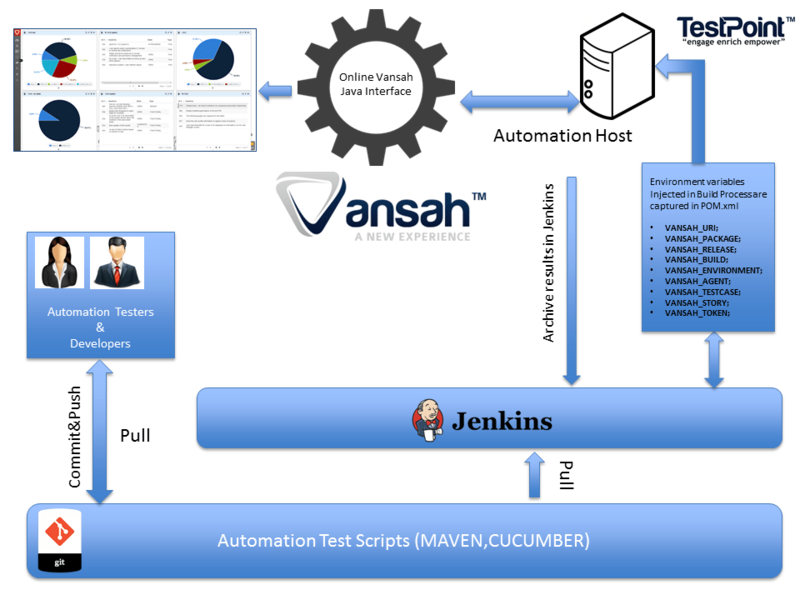 TestPoint’s Vansah automation framework provides an integrated and open source web service which can be invoked from any automated testing tool and framework. Your Automation test scripts are organized with in a maven test package and the development scripts are organized with in main package. Whenever the developer commits the changes, Jenkins poll for changes and it will start the build process. It is responsibility of the developers or DevOps to specify the post build action where the particular build has to be deployed. With MAVEN you can use JUNIT, CUCUMBER or TestNG or the frameworks of your choice. During the build process the automation test scripts will pulled from the git repository and deployed on the slave machine and the test scripts will be triggered. New cases, requirements and release notes are automatically created in Vansah as part of continuous integration. How to use the new Vansah Webservice Interface from Java? To use Vansah Interface with in you test script, we need to initialize the “VansahInterface” Instance. In real time while your scripts are running you will be notified in Vansah and users can see the results of a particular test package. You can also continue execution of other test cases using the manual tester option available in Vansah.